Thick aluminum diffuser bottom, with a stainless steel insert suitable for all types of heating surfaces including gas, electric, radiant and induction. Extra thick aluminum body with 4 layers nonstick coating. Cast stainless steel cold handle. Do not use stainless steel utensils. Do not over heat fry pans. Use a sponge without a pad for cleaning. The Matfer Bourgeat Elite Pro 9 1/2 in. Non-Stick Fry Pan has a thick, heat difussed base with special induction stainless steel bottom plate. 4-layer non-stick coating with anti-scratch protective undercoating. Aluminum "cool touch" handle. The Matfer Bourgeat Elite Pro 11 in. Non-Stick Fry Pan has a thick, heat difussed base with special induction stainless steel bottom plate. 4-layer non-stick coating with anti-scratch protective undercoating. Aluminum "cool touch" handle. The Matfer Bourgeat Elite Pro 12 1/2 in. 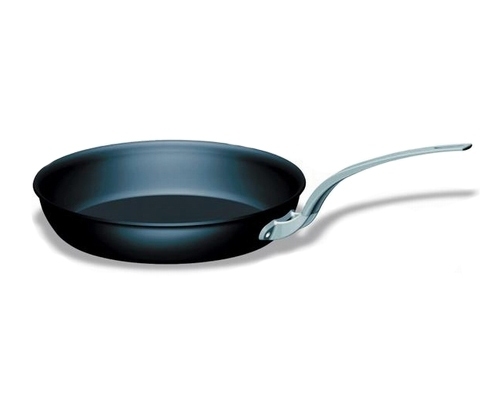 Non-Stick Fry Pan has a thick, heat difussed base with special induction stainless steel bottom plate. 4-layer non-stick coating with anti-scratch protective undercoating. Aluminum "cool touch" handle.